Hi, I have just bought a 1976 GL1000. It appears to be in good shape, the paint is faded and I will repaint this winter, but it all looks to be there. The previous owner pulled the engine and primed and painted the frame; he polished the engine, although (thankfully) did not split the engine block. The instruments have been replaced so the mileage is unknown but the overall wear and tear on the bike looks modest, so I am assuming it is low.... I am pulling the ancillaries off and checking things over. There are some wiring bodges that need to be cleaned up but overall I am happy. I have ordered probably the usual things that everyone does at the start of a refresh; seat cover, caliper pistons, brake pads, belts, oil filter etc, but I need to find the two rubber rings that sit inside the chrome instrument housings, to isolate the tach and speedo from vibration. Mine have crumbled away almost to dust and, despite my best efforts, I can't find anyone that has them. Does anyone know where I could track two down? I am fabricating a replacement exhaust system. The original had obviously decayed away and the previous owner found a GL1100 system that he purchased but did not fit. I looked at it last night and, to be honest, it's in pretty rough shape so I am not going to spend too much time on it. I would prefer to fabricate something new. As the project comes together I will post a couple of picture. I don't want to make anything too radical, I just love the look of the original, wire wheeled GL1000. If there are any Canadian GW owners on the list in Victoria/Vancouver area please feel free to send me a personal message. I don't know anyone else with one of these bikes and am always interested in talking with others who have had their bikes for awhile. Congrats. Pretty bike. 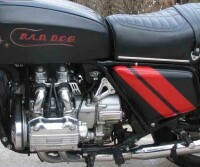 Search here and elsewhere online for information on adapting Harley Sportster mufflers. They can usually be found like new and cheap. They look and apparently sound good, and aren't difficult to mount. You just need to fabricate short adapter pipes between the header pipes and mufflers. If you need the little black plastic caps that hide the handlebar bolts, just go to a Kawasaki shop and pick up or order ones for an '86 Concourse. Of course, they must have a bit of gold dust in them but at least they are available. +1 on the HD mufflers. I have them on mine altho I do have an almost perfect OEM set for my 78. 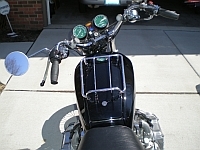 The HD mufflers go right on the headers with only a small adapter needed. Make or buy a set of brackets for support and you are all done. Never heard of any source for the rubbers tho. You might have to fabricate those as well. Crumbling rubber is rare, so buy another set of clocks cheep and you can most likely get good rubber bits. If a bike sits near an air compressor, the ozone from the arch does the rubber in, but it is somewhat rare so most clocks have good rubber. If you are not in a hurry, PM me an address and perhaps I can figure out how to mail a set across the boarder. Look on ebay for cb500 speedometer rubber from Everett Power Sports. I bought two as replacements for a 75 Gl1000 for less than $40 for two. Will fit speed and tac. Thanks very much Fatalbert, I have just ordered the parts from Everett Power Sports. Appreciate the advice offered today regarding the exhaust. I have a few ideas and will post pictures of what eventually gets built. If you don't know the service history for absolutely sure, CHANGE THE CAM BELTS! These are interferrence engines and if a belt lets go, at the least you are looking for new valves. At the worst, you are looking for another engine! Also, check out my website at the foot of this post for more techy stuff. Good advice, I have heard similar warnings from a couple of other sources too. I went ahead and put a set of Gates belts on, together with two new idler tensioners. The bearings in the originals sounded loose and I was surprised to feel how tight the new ones were. So far I have been going over the bike carefully and have been cleaning and checking stuff over. I found a few things that needed to be fixed and replaced a few bits of dubious wiring. The cam covers will go on today and then the radiator and fan can be refitted. I am waiting for a front caliper seals kit to arrive and then the brakes can be reassembled. The instrument faces were pretty faded so when a pair of replacement faces get here the clocks can be reassembled and refitted. I went with a set of flatter bars so a friend machined in the slots needed to chase the wiring through. I am waiting on a a replacement seat cover from B and H in Florida and then I can finish the seat. The foam is in good shape and the pan braced in a couple of spots and repainted. I am going to put a set of Norton peashooter exhausts on and will be making the suitable transitions to allow that to happen. The bike is a 1976, however when I bought it it came with a exhaust from a 1978/1979 Goldwing. They are slightly different and I could make it work, but in the end it is probably easier to just go with the Norton style exhaust. Has any one else done this? Any advice? Finally I need to address replacement direction indicators. Has anyone got any good ideas, sources that I should look at? I am interested in looking at original replacements or LED substitutes. Mmmmm... not sure I have the space to go this route. I would like to use the original mounting holes to fit my new indicators, whatever I end up buying. Here is the link for the exploded view of the front ts bolt or stem, and the part # and price as well. Unfortunately, no thread spec.. I see this fits the GL1100, do you know if the GL1000 instrument clusters are the same? Thanks Old Fogey. I see those are the exact same rubbers for the instruments for a GL1100 set of gauges as well. Coincidentally I'm also just replacing my set with new ones too. Check the prices between your Honda dealer and ebay Saltspringer because if you live in Canada and the parts are coming from the USA the conversion to Canadian dollars from US dollars right now will be a lot higher than you think. Add shipping in US dollars to it and you will probably be better off going to a Honda dealer and ordering a set from them directly. Good advice. I will shop around and see what I can come up with. The Goldwing bodywork is all painted and the decals disappeared under clear coat about a week ago. I am foing to do a final wet sand and polish and then they can go back on the bike. I recovered the seat yesterday and it looks great. I bought a replacement seat cover off B and H in Texas, its very high quality, not cheap but great construction and attention to detail. The only thing I was surprised at was there was no gold Honda logo on the rear panel.... I can certainly add one with my air brush but I kinda assumed it would already have one. Brake pads arrive this week, and then the last thing is rebuilding the carbs. I have the Sumo rebuild kit which looks pretty comprehensive. I am going to carefully compare the OEM parts with the replacements and will probably try and use the OEM pieces if they are serviceable. Once the carbs are back on it is time to try and start the bike. You will hear that a lot of companies get a 'Cease and Desist' order from Honda over the use of their logos. That may be the reason for the missing gold name. Try this for the gauge rubbers. It says 1100 but I have bought a few of these and fit the 1000 perfectly. Also another is Sirius .com. They are both in SW Ontario, but prices are in US$. I have 3 red GL's. Thanks Timthumb, I can confirm that rubber instrument cushions 372-323-700 are the correct replacement for gauges on a 1976 GL1000. I talked to Honda and they told me that they are officially no longer available through dealers. I was also surprised to hear that brake rebuild kits were also considered no longer available, although obviously aftermarket versions are online. The Goldwing paint was very sun faded and cracked. I filled some dents and repainted everything, put on new decalsand cleare coated. It is now done. Yesterday I started putting paint on the '46 Harley. It will take about a month to get it all done. The aim is to have both the Harley and the Goldwing ready for riding in the Spring. That paint job sure looks great. What was the paint code and brand name that you used? It was a special mix. I found a paint guru called Daryl at my local Lordco in Victoria, BC. He spent about two weeks building the perfect match and I must admit he did a stellar job. The labels and contact details are below, you can give him a call, quote the Lordco 548 paint code on the label and he should be able to give you the final mix of paint and metallic component. I use JBPX #1 PPG Shop Line paint, which seems super forgiving with regard to humidity and temperature, with a low-pressure, $100 spray gun and a standard shop compressor. The metal parts were sand blasted and shot with acid etch primer, then primer. Plastic parts just had primer, base color coat is applied and dries sort of matt. After flattening with 1000 sand paper (with warm soapy water) and applying decals I shot several coats of clear over the top to give the depth of shine. The clear is then flattened with 1500 and 2000 paper, before a final polish with a power polisher and Norton's cutting compound. I don't have a very sophisticated set up, but do have the luxury of time. This allows me to let everything dry and prep before I go to the next steps. I can see a commercial shop would want to hurry this type of job through the shop much faster than I allow, since they need to get these jobs in and out the door to make a living. The cost of a professional paint job is beyond my budget but I am pleased that it is seems possible to get a good finish with a home-based set up. I am happy to discuss the painting lessons I learned with anyone who wants to give it a go themselves.